I have a new hero! Daily driving a 1930 Model A for a year. People do stupid things. Other people do awesome things. Johnathan Klinger does “Boom! Goes the Dynamite” things. 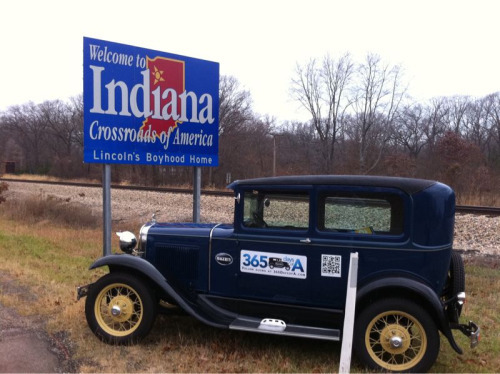 Yep, he is driving a 1930 Model A Ford as his only car for 365 days. His blog is at http://www.365daysofa.com/ He details everything from being the center of attention to fixing oil and fuel leaks. Being an automobile owner was far more work and maintenance back then. Things like idle mixture and timing and other engine adjustments were just a part of each day’s motoring. The A didn’t have a radio, a heater, cupholders, or any of the things that make modern cars nice…and dull. This is a great idea. I should have thought of it…and done it…think I could add some cup holders? This entry was posted in Items of Interest (Not for sale), Uncategorized. Bookmark the permalink.